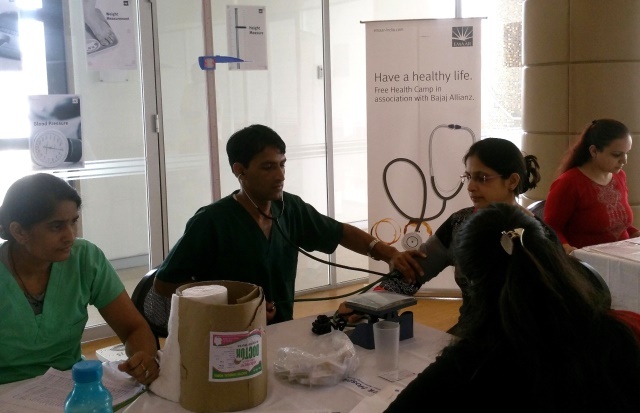 A free health check-up Camp was organized by Emaar India at The Palm Drive located on the Golf Course Extension Road, Gurugram. It was conducted by the real estate company, along with its health partner Bajaj Allianz and a team of specialized doctors from Park Alchemist Hospital, Gurugram and Lenskart. The Participants included The Palm Drive residents and site employees from Emaar India’s project sites on Golf Course Extension road. The Check Up included general health check-ups for height, weight, Body Mass Index (BMI), blood pressure, blood sugar, eyesight, etc. Participants were also given a health awareness session conducted by the doctors with regards to lifestyle diseases, timely diagnosis and preventive measures to be adopted for a healthy life. More than 150 people participated in the camp.